The first component picked up by this PCA appears to be an Atlantic one. 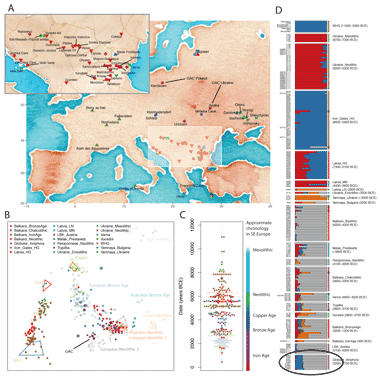 It peaks among the Cornish samples, but shows similar levels in all the British, Irish, French, Dutch and Belgians (post-Black Death mobility?). If we are to assume that I identified the component correctly, then it appears as if the East Finns, Vologda Russians, Erzya from the Middle Volga, and Lithuanians are the least “Atlantic” samples in this analysis. These groups, especially the East Finns, also happen to act like relative genetic isolates in many of my experiments (such as ADMIXTURE and MDS analyses). Thus, it seems they've been sheltered from significant gene flow from outside in recent times, including from the west, like German emigration to East Central Europe and Scandinavian influence in Western and Southwestern Finland. I've been reading for several months now this blog (and Dienekes, and others), but I still can't understand the clustering algorithm used by this program STRUCTURE. I could not find the source code, does anyone have a link to it? I'm particularly interested in the way that it chooses the value of K and how it manages sub-clusters, etc. Also, when performing dimensionality reduction into 2D, How much variance is lost? 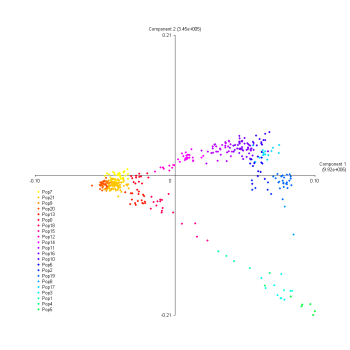 Is there any principal eigenvector that is present exclusively in a subset of clusters? I'm very interested in the inner workings of the calculations, the vectorized representation of discrete valued DNA, etc. Unfortunately there is very few readily available information.